Most of our research is now in progress but there are still one or two research questions scheduled to start. With that, I would like to welcome Sam Herniman, our newest researcher. Sam started in January and will be working on Q18 with Nicholas Coops at UBC. Chris Mulverhill is a PhD student at the University of British Columbia (UBC) studying under the supervision of Dr. Nicholas Coops. His research focuses on the use of ALS and photogrammetry to improve characterizations of tree stems across scales in the boreal mixedwood forest. Chris is currently working on Question 7 of Theme 2. Chris completed a degree in Environmental Science at the University of Oregon in 2016. While there, he was introduced to geospatial technologies for modeling forest biology and ecosystem dynamics. These interests eventually led him to an undergraduate research position studying patterns of the mountain pine beetle outbreak and fire management. Chris came to UBC to further his studies with a Master’s degree in the summer of 2016. As a part of the AWARE project, Chris’s research explores the ALS-based estimation of stem size distributions in a mixed forest near Slave Lake, AB. From this, he aims to understand the influence of ecological factors on forest structure and the relationship of stem size distributions to forest management. Hoping to grow both the scope of his research and the length of his student visa, Chris changed his degree program to a PhD in January 2018. His PhD research will use terrestrial photogrammetry to characterize individual tree measurements and plot-based estimates of tree merchantability. He hopes to use this information to inform the decisions of forest managers and ecologists to improve the long-term health and sustainability of forest resources. Outside of the lab, Chris enjoys taking in all that the Pacific Northwest has to offer. Regardless of the weather, Chris is a runner of the nearby mountain trails, climber of local crags, and frequent patron of Northwest breweries. Bastien Vandendaele is a PhD candidate at the Université de Sherbrooke (Canada) and the Université de Liège – Gembloux Agro-Bio Tech (Belgium) under the supervision of Pr. Richard Fournier and Pr. Philippe Lejeune. 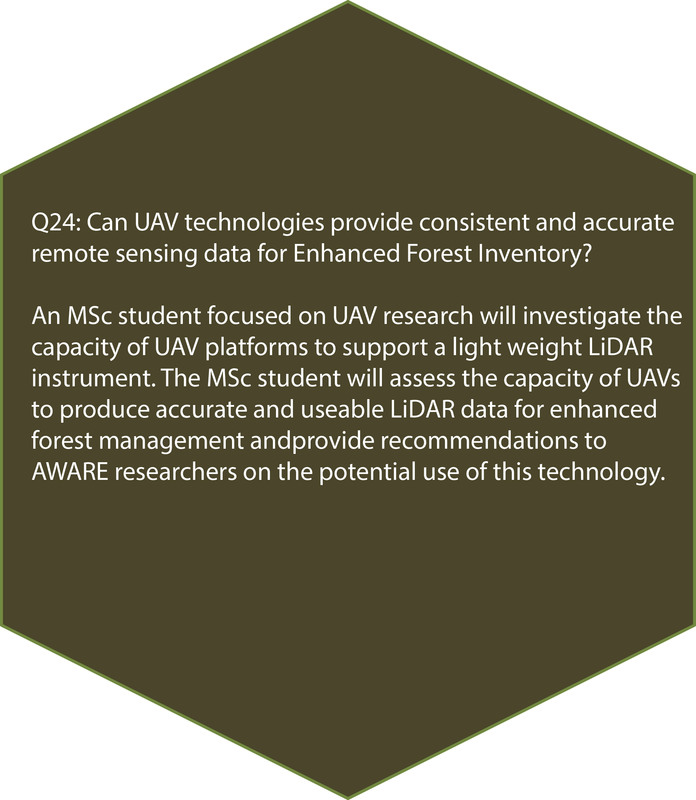 For his research on Question 24 of Theme 4, Bastien works in collaboration with FPInnovations and the Northern Hardwoods Research Institute Inc. to investigate the potential of UAV (Unmanned Aerial Vehicle) Laser Scanning (ULS) data to estimate tree-level structural attributes. The recent developments of UAV and lidar systems allow new procedures to improve current forest inventories. The operational flexibility and high spatial and temporal resolution of UAVs combined with the capacity of lidar signal to break through forest canopy makes this technology a promising tool for the characterization of forest structure at the tree-scale. Due to the low altitude, the large scanner field-of-view, the small footprint size and the high effective scan rate, ULS data can be used to derive 3D models of individual trees and characterize understory vegetation. This project aims to develop methods to estimate tree-level (DBH, stem taper, crown dimensions and height) and plot- to stand-level structural attributes (diameter distribution, basal area, merchantable volume) from high density ULS data applicable to managed and unmanaged forest stands. Method development will be supported by a wide range of datasets collected at two test sites: one in the boreal deciduous forest (northwestern New-Brunswick) and the second one in the boreal coniferous forest (eastern Ontario). For both study sites, in situ field measurements were collected to serve as reference dataset to compare the results obtained with ULS data. Results from Terrestrial (TLS) and Airborne (ALS) systems will also be used to assess the gain obtained with the ULS data. All data sources have now been aligned, enabling the cross comparison of results. Bastien is currently working on adapting TLS and ALS methods to ULS data namely to segment individual tree and estimate their DBH. He developed a first automatic point cloud processing chain in the open source software Computree (from Office National des Forêts (ONF) of France). In this process, stems are isolated directly from the point cloud and a shape fitting algorithm is employed to estimate DBH. The first results generated on the deciduous forest site (acquired with ULS in leaf-off condition) are promising as they match closely what can be estimated from in situ or TLS data and exceed what can be estimated with ALS (see Fig. 1). The next research steps involve the development of stem taper estimation, understory characterization and the adaptation of methods for unmanaged forest types. Figure 1: (A) Alignment of three lidar data sources: TLS (black), ULS acquired in leaf-off conditions (green) and ULS acquired in leaf-on conditions (red) with a zoom at the tree-level on the upper right corner; (B) Sample of fitted cylinders (grey) on ULS point cloud (leaf-off) for the automatic and direct estimation of Diameter at Breast Height generated in Computree’s open source software; (C) tree diameter distribution in a 1 ha deciduous stand (n= 407 trees) of McCoy Brook Forest (northwestern New-Brunswick); dark grey: in situ field inventory; light grey: ULS. 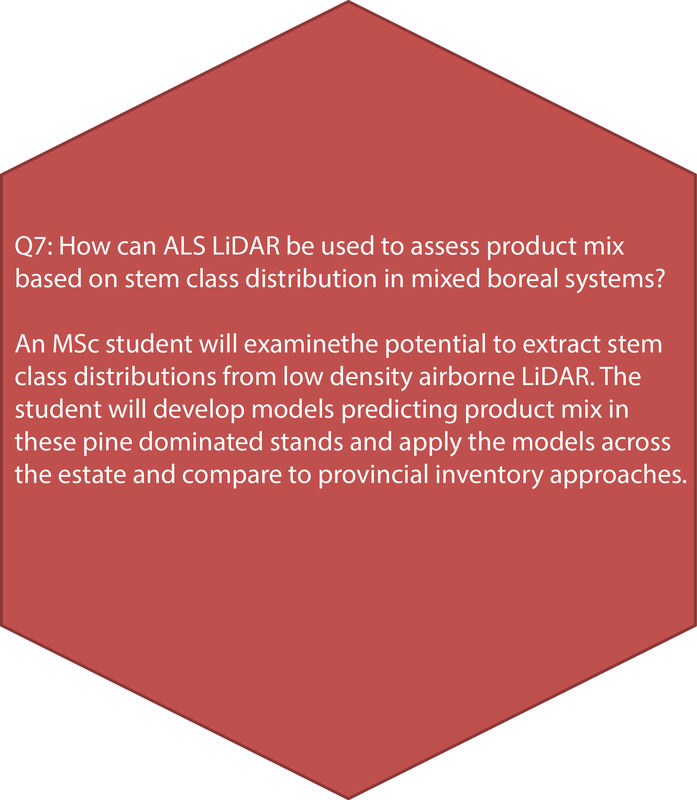 The lidR package was developed by Jean-Romain Roussel, a PhD student working on question 8 in the AWARE project. It is designed to manipulate LiDAR data in a forestry and ecology research context and is rapidly gaining popularity around the world, as evidenced by the download statistics of the Rstudio servers. According to the feedback we received, a growing number of researchers (mainly students) are moving their LiDAR workflow to R because they appreciate the flexibility and straightforwardness of lidR. The lidR package, as well as the rlas package that drives las/laz files I/O and the PointCloudViewer package that drives 3D display of large point clouds wwere all developed with the financial support of AWARE. Thanks to their support, we plan to continue the development of these packages in 2018. Jasmin Seifert, a computer programmer from France will be implementing several tree segmentation algorithms described in the scientific literature for a six month internship. We also plan to implement several more algorithms either from the literature or following conceptual requests made by users in the community. We will keep aiming to improve performance in terms of speed, memory (quite a challenge in R!) and providing more features in batch processing. In doing so, we also wish to stimulate the recruitment of contributors to ensure the long-term success of the packages. The Y3 annual general meeting will be held in Montreal, QC from Jun. 5-7th, 2018. The first two days of the AGM are for AWARE researchers, selected government researchers and industrial partners only. A preliminary agenda is available on our website. Registration for the AGM is by invite only. If you are an AWARE supporter and have not received yet an invitation, please contact Curtis Marr.